Skipper Jack Baldwin is back in the Posh squad. Manager Grant McCann has pledged Peterborough United will attack Aston Villa in their mouthwatering FA Cup clash at Villa Park tomorrow (January 6, 3pm). 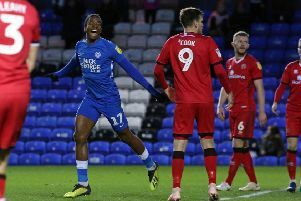 It’s a daunting task in a third round tie for Posh against a team hitting top form in the Championship, but McCann is backing his players to contribute fully to an eagerly-awaited contest in front of close to 5,000 travelling fans. Leo Da Silva Lopes could start for Posh at Villa Park. Posh follow the Villa game with a last-16 Checkatrade Trophy tie at League Two leaders Luton on Tuesday (January 9). “It’s a game we’ve been looking forward to for a long time,” McCann stated. “We’re under no illusions about the task facing us against a massive club with quality players and that’s the case no matter what team they put out. “I watched them beat Bristol City last week and although City were good for 20-25 minutes, once Villa stepped up a gear they blew them away. “But we have good attacking players as well. If we can get the balance right behind them we can cause Villa problems. We will try and play on the front foot and get on the attack. “We have good form against the so-called better teams this season. They are games the players get themselves up for very easily - it’s my job to get them up like that for every match. “But we go there in decent form. We were obviously disappointed with our last two results, but we’ve been pretty consistent over the last 15-16 games or so. “We can switch off from the league for a couple of games now. We can play with freedom and a smile on our faces tomorrow, but we want to win both matches. Posh skipper Jack Baldwin is back in training after recovering from a hamstring issue, but is not expected to start. Posh could use the athleticism of Leo Da Silva Lopes in midfield. Villa are expected to field several youngsters tomorrow, but most have been in and around the first-team squad all season. Villa are currently fifth in the Championship, five points off an automatic promotion place.